Beautifully aged historic cabins located just outside Asheville North Carolina we offer the best cabin rentals on our side of the Blue Ridge Mountains. We have long-term rental options and group discounts for 3 or more cabins in one booking (group discounts not available during holidays or high seasons). Take a Serene Retreat, enjoy Long Range Mountain Views of the Blue Ridge Mountains and French Broad River or enjoy fishing in the stocked waters of Hidden Pond. Nestled under the pine trees only six miles north of downtown Asheville. The Log Cabin Motor Court is the perfect jumping off point for the Biltmore Village, Blue Ridge Parkway, Smokey Mountain activities and all Asheville has to offer. A rustic stopover that time forgot will be a treat you'll long remember. Located just six miles from downtown Asheville, North Carolina we offer the best cabin rentals on our side of the Blue Ridge Mountains. Accommodations consist of beautifully aged historic cabins originally built in the 1930s. Our one and two-bedroom cabin rentals are conveniently located to downtown Asheville, North Carolina. Many of our cabins have fireplaces and kitchens, all have air conditioning. Located between US 25 and US 19-23, it is a natural haven, but close to urban areas. Less than six miles to the center of downtown Asheville, with its abundant shopping, dining, arts and entertainment, the world famous Biltmore Estate less than 8 miles. Take a leisurely stroll around Beaver Lake, less than 3 miles away, or Lake Louse at just 6 miles. Picnic along the French Broad River at just 2.6 miles or cruise the Blue Ridge Parkway, just 10 miles away. Other area attractions include the quaint town of Weaverville, a few miles to the north, the 435 acre North Carolina Arboretum and the Pisgah National Forest. Make the Log Cabin Motor Court your jumping off spot for any adventure in Western North Carolina. Our historic log cabin rentals are conveniently located to downtown Asheville NC. Many of our cabins have fireplaces and kitchens, all have air conditioning. Consider sitting back in a historic cabin, feel the charm, feel the history then look it up on the Internet. 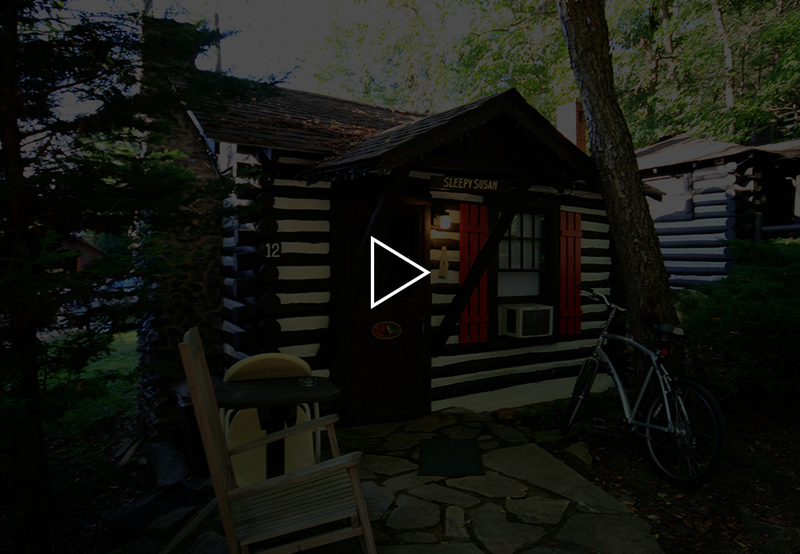 All of our cabin rentals have FREE wireless access, today’s comforts with yesterday’s ambiance. A rustic stopover that time forgot will be a treat you’ll long remember. The Log Cabin Motor Court is pet-friendly. You will find a fenced pet play area along with fenced yards around two cabins for the comfort and enjoyment of your pets. A pet free cabin is also available for our guests with allergies.